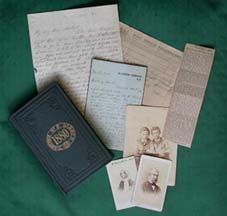 Surrey History Centre is constantly striving to expand its holdings and acquire documents and books which will be of interest to students of the county and its heritage. We welcome approaches from organisations and individuals who might be interested in donating or loaning material. photographs, postcards, engravings and paintings of Surrey scenes or people. Any such material can be either presented to the Centre as an outright gift (our preferred option) or deposited with us as an indefinite loan, in which case ownership remains with the depositor. Papers containing information of a sensitive nature can be closed to public access for a period to be agreed with the depositor. Please see our formal terms of deposit of records (below). storage in a secure, environmentally controlled strongroom and additional packaging in suitable, acid-free folders and boxes if necessary. supervised production to interested researchers in our public searchroom. The County Archivist is Michael Page, and he is always happy to hear from potential donors or depositors. He can also advise if another record office or library might prove a more suitable home. Contact him on 01483 518737 or Contact Surrey History Centre online. Surrey History Centre is unable to care for 3D objects. Please contact your local museum or gallery to find out how to deposit objects.